Now that the Seville season is over, I am looking for new things to write about that don't involve actually making marmalade. While thinking about this last night, I remembered that I had a jar of Yuja Cha lurking at the back of my fridge that I hadn't yet investigated, so I pulled it out from behind several other neglected jars and boiled the kettle. I first heard about this hybrid preserve/drink from a cousin of G's, who travels to the Far East regularly and told me that the Koreans make a kind of marmalade as the basis for a hot drink. Made from yuzu, a Korean citrus fruit, it is a peel-heavy preserve that you simply add to hot water for a very refreshing drink. It happens that one of the parents in my son's class is Korean, so I asked her about it. She said it was hard to get here, but would ask her family to bring some over – and so they did. 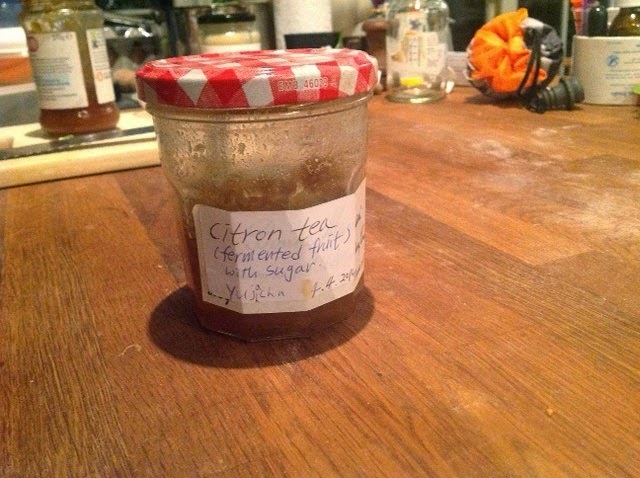 A few weeks later, she presented me with this jar – homemade and hand-labelled in English, just for me. Inside was a concoction of thick-cut, bitter peel in a sticky, sweet jelly, almost like a candied peel. I noticed that they had written 'fermented' on the label, rather than just 'preserved' – and it has in fact been in my fridge for a year or more, but is not at all spoiled, so is clearly a brilliant way to keep oranges edible (the original point of preserves). 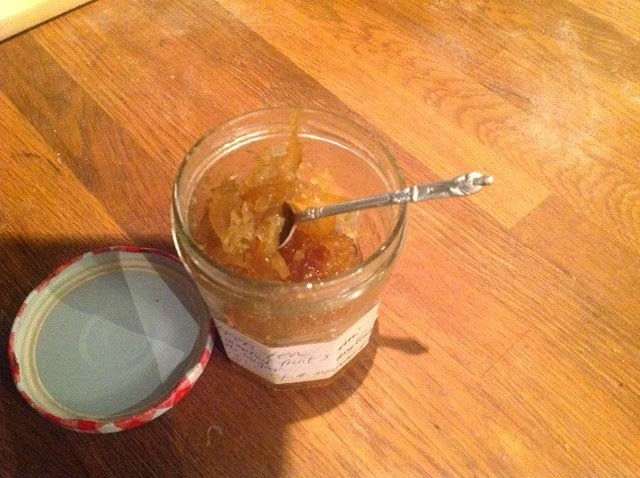 Tasted alone, it is quite bitter, so clearly uses far less sugar than actual marmalade. Dissolved in a cup of hot water it is astringent, not too sweet and very refreshing. I can't imagine why we haven't adopted this in England as an alternative to lemon and ginger, which I don't really like. The Koreans make medicinal claims for it, just as we do for hot lemon and honey or orange juice; full of vitamin C, it is allegedly good for colds and flu. Just the smell alone would cure me. I recommend it.